Pray for release for Pastor Andrew Brunson in Turkey. Continue to remember those in prison as if you were together with them in prison, and those who are mistreated as if you yourselves were suffering. (Hebrews 13:3). A little over a week before the next hearing for U.S. Pastor Andrew Brunson, a Turkish newspaper, the Hurriyet Daily News, is reporting that “many” diplomats in Ankara expect the “imminent release and deportation” of the North Carolina pastor. 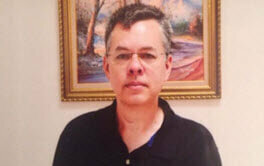 In a column for the Hurriyet, entitled “Pastor Brunson’s Detention Has Become Too Costly for Turkey,” lead Turkish commentator Serkan Demirtas suggested that the continued detention of Pastor Bunson would further complicate the situation between Turkey and the U.S.
Phillip Kosnett, American Charge d’Affaires at the U.S. Embassy in Turkey recently echoed Demirtas’ comment, saying that the country’s continued detention of pastor Andrew Brunson on spying and terrorism-related charges is impeding U.S.-Turkish relations. . . .
Pastor Brunson is accused of espionage and terrorism while he led a small church in Izmir. Over the last two hearings in April and May, the prosecution has produced no credible evidence. The trial has been widely criticized as a “sham” with Pastor Brunson being used as a political pawn. Erdogan has essentially said he will trade Pastor Brunson for Fethullah Gülen, the Muslim cleric Turkey has accused of starting a coup. Erdogan has demanded Gulen, now living in Pennsylvania, to be extradited by the U.S. The 62-page indictment bears more evidence that he is a victim of persecution, with “Christianization” being called “a hostile act.” Turkey is No. 31 on the World Watch List. If convicted, Pastor Brunson faces a life sentence of 35 years. He has vehemently denied all the charges. Please continue to pray with the Brunson family as the third hearing approaches in Izmir on July 18. “With all prayer and petition pray at all times in the Spirit, and with this in view, be on the alert with all perseverance and petition for all the saints” (Eph. 6:18). Praying to Almighty God for Pastor Brunson’s family and that You would sustain and uphold them. Almighty God, I pray again in Jesus Name that You would remove the powers that be and that You would clear the path to freedom for him. I pray for these next 24-48 hours where there seems to be some things stirring according to the ACLJ. I pray that You would open doors and that You would work through all resources to bring Pastor Brunson’s freedom. Father God, please give 100% victory to Pastor Brunson. I pray for the ACLJ and others who are working on Pastor Brunson’s case and that You would give them big success. I pray in Jesus Name, amen. Father God, I pray for Your servant Andrew Brunson and I pray for his freedom. I pray in the Name of Jesus that You would strike down and remove any spiritual forces that are keeping Pastor Brunson in Turkey and that You would clear his path so that he can come home to his family who needs him. Please God, he has been held long enough. Please free Pastor Brunson and bring him back home. This has gone on far too long. I pray for those who are working on Pastor Brunson’s freedom, that You would give them success and that they would make his freedom a top priority. I pray in Jesus Name, amen. Praying for Pastor Brunson and his precious family. Lord God may You be glorified in this trying time – I pray for the Salvation of the Turkish people may they come to the saving knowledge of our Lord Jesus Christ. And I pray for the relations between Turkey and the United States – May the relationship improve and God’s blessings be upon us both. My prayers for Pastor Brunson and for his freedom. I pray for God to strike down anything that’s keeping him in prison and that he would be freed and returned to his family. I pray in Jesus Name.